header or the footer area, as well as left, centered, and right alignment options. A drop-down menu with various styles allows you to choose how the page numbers will look in your text. “Check Spelling/Grammar” opens a dialog that can be used to check for spelling and grammar mistakes. “Revision Tracking” is useful for making changes (made by a proofreader or an editor) visible and allowing you to go back and accept or reject them. The settings for revision tracking can be changed in “Preferences” → “Appearance” → “Revision Tracking.” There is also an icon in the toolbar, with which you can turn revision tracking on and off. The Navigator normally appears on the left side of your Papyrus window and is there to give you an overview of your text. Choosing the “Navigator” option in this menu will open the Navigator in its own dialog. 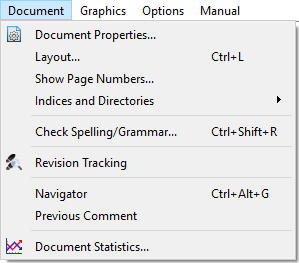 “Document Statistics” opens a dialog with statistical data (number of pages, paragraphs, lines, words, characters with and without spaces, etc.). There is also data for the fonts and style templates used in your text, as well as the pictures, which you can choose to convert to an external file here. The “Front Matter” stores additional information about your document, as do the “Book Description” and the “Document Metadata,” which are required for compatibility with MS Word. This information includes the author, title, publisher, etc. “Document Backups…” saves backup copies of your text, which we highly recommend for preventing unwanted data loss. “Important Backups Log…” is closely related to the important backups. 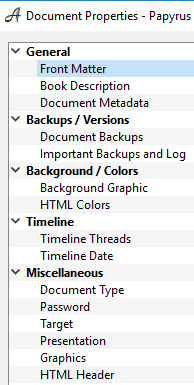 Here you can see and open all saved versions of your text, as well as create new backups and comment on backups already in the log. “Background Graphic…” displays a graphic behind the main text, which will not appear when printed. “Document Colors” changes the text colors and are not printed, such as the blue color that has been used in this document for hyperlinks. If you find it easier to work with, you can change the document text color from black to another color and even change the white document background. The colors you choose are important for exporting in HTML. “Document Type…” opens a dialog, in which you can choose between a normal document, a template, and a form. “Target…” allows you to add a progress bar to the status bar at the bottom of your Papyrus window. This progress bar can be assigned a target and will then show you exactly how close you are to meeting your goal for the day and for the text in its entirety. “Presentation” will open a new dialog in which you can change the display settings for a presentation mode, such as how your document will be displayed if it does not fit the screen 100%. “Graphics Import…” determines whether imported pictures will be stored in the document file or whether they will be saved in an external reference file. “Page Layout…” opens a dialog in which you can set the size of the margins, header and footer area, as well as the number of columns. “Page Numbering” allows you to determine what page number your main text will begin on and how the table of contents will be numbered. 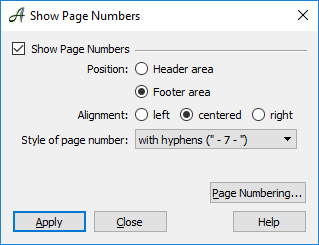 “Master Pages…” will open a dialog, in which you can choose from a variety of master pages with various margins, header and footer areas, columns, and more. You can also create your own master page in this dialog. “Assign Page Range” allows you to assign a specific page range to your master page. “Footnotes…” sets the numbering and the separating line for footnotes. “Paper Format…” is where you can set what type of paper you would like to work with. You can decide between a portrait or landscape format, and have the option to print special formats such as labels, envelopes, etc. “Table of Contents…” contains all settings for your table of contents and allows you to create a table of contents as well as other directories. “Index…” is where you can create an index of all keywords at the end of your document. “Endnotes…” allows you to create an endnote database and change its settings. 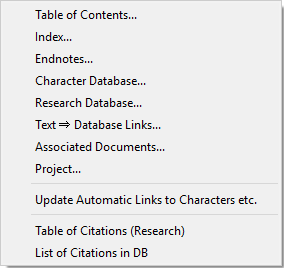 The character and research databases can also be accessed in this sub-menu. Each database has been devoted an in-depth article. “Text ↔ Database Links…” allows you to hyperlink spots in your text to a database entry. The links can then be opened in your text by clicking on them. “Associated Documents…” are documents important for the document you are currently working on. These could be normal Papyrus text documents that contain comments and notes about your main text. You can also choose if you would like the associated documents to open each time you open the main document, or whether you would only like them to appear in the favorites of the “File” menu. A “Project…” is the combination of a main document with various “additional” documents, such as a Character Database, notes, etc., that can all be found in the same folder. The option “Update Automatic Links to Characters etc.” will go through your text and search for the names of characters that appear in the Character Database. These places where your characters appear will be linked to that character’s entry in the database. The places where your characters appear can also be displayed in the Navigator. For more information, see the article about the Navigator.